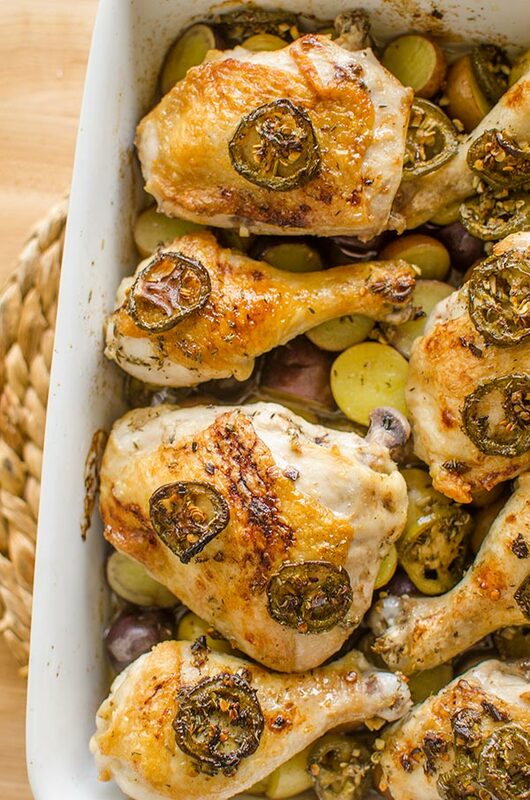 This recipe for balsamic jalapeno roasted chicken and potatoes is the ultimate comforting dinner recipe. I wasn’t too excited about September being here until today. I know, we’re basically halfway through the month, so I’m a little slow on the uptake. I took a look at the current vibe of my homepage and realized that it still has all the summery vibes and very little fall happening. Not good! After all, fall and winter are my favourite seasons for cooking. This chicken and potatoes recipe is the perfect fall recipe and it incorporates two of my favourite ingredients to work with; jalapeno and balsamic vinegar. My love for this combination, comes from my dad who is obsessed with all things jalapenos. Whenever I ask my dad for his advice or thoughts on a recipe, he’ll always answer ‘How about adding some jalapenos?’. For a while, he was serious, but now it’s become more of a joke. The brownies I’m working on? Jalapenos are the missing ingredient according to my dad. While jalapenos don’t work in every recipe, despite what my dad thinks, they do really work here. The jalapenos get delightfully crispy in the oven, and this is a mild enough pepper that instead of adding a ton of heat, they also add depth of flavour to this dish. You’ll be surprised by the amount of flavour in this dish when you look at the ingredient list, but you guys, this is what I’m all about. I’m always trying to create dishes with big flavour. 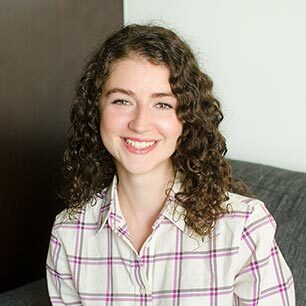 Plus, if you’re a city-dwelling, long-hour working millennial gal like myself, this is the kind of meal you can make on a Sunday and eat throughout the week. this has been my dinner for three nights in a row, and I’m not tired of it at all. Plus you can save the chicken bones and make a delicious chicken broth. The trick to this dish is in the timing, I cook my potatoes for 10 minutes in the oven before adding the chicken–they take a little longer and the last thing you want are undercooked potatoes or overcooked chicken. No thank you. While your potatoes are cooking, I sear the chicken–this is where the golden and crispy skin coes from and the additional flavour. Don’t skip this step! Then whisk together a quick sauce and pour it all over the chicken and potatoes, into the oven it goes and 30 minutes later dinner is on the table. Preheat oven to 350F. In an oven proof baking dish, toss potatoes in 1 tsp of olive oil. Season with 1/4 tsp of salt, and roast for 10 minutes. Meanwhile, in a medium bowl, whisk jalapenos with garlic, 5 tsp olive oil, balsamic vinegar, honey, dried thyme and 1/4 tsp of salt. Set aside. Season chicken with remaining 1/4 tsp of salt. Meanwhile, heat a medium saute pan over medium-high heat, add 1 tbsp of olive oil. Sear chicken, in two batches, skin-side down for 3 minutes per side. Remove and set aside. 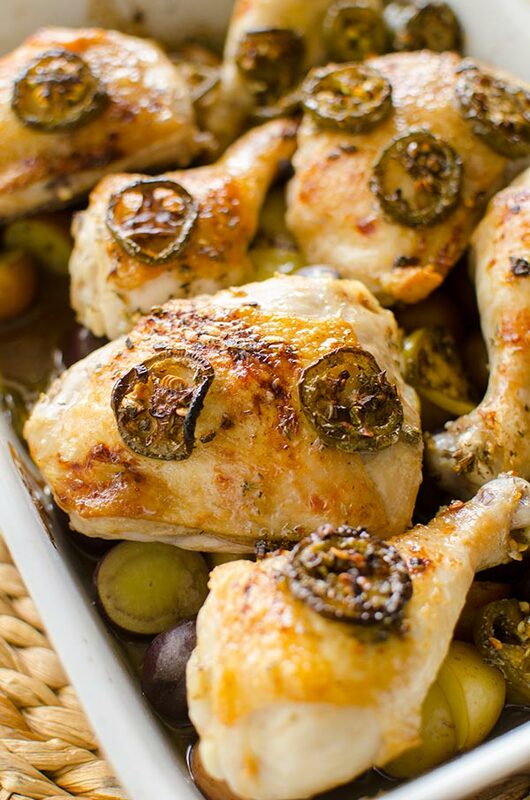 Arrange chicken on top of potatoes, pour jalapeno mixture on top. Roast in the oven for 30-35 minutes or until chicken is fully cooked and potatoes are done. 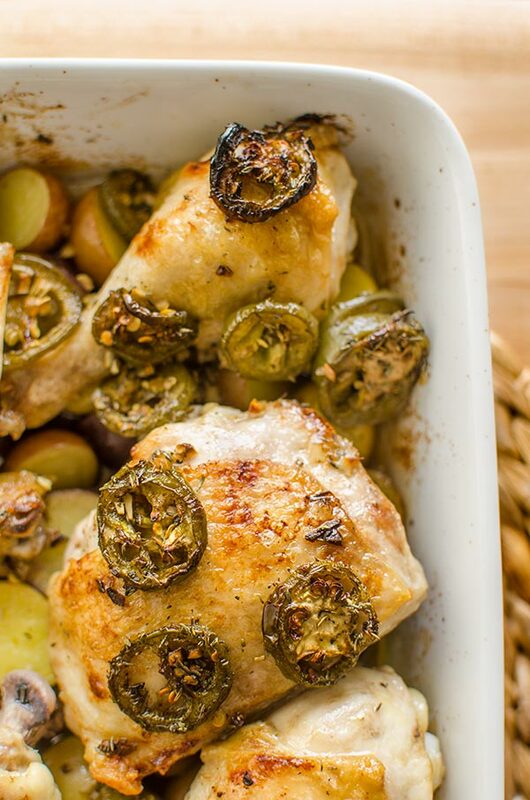 Let me know if you give this recipe for balsamic jalapeno roasted chicken and potatoes a try in the comments below. Wow! !This looks implausible! Can’t wait to make it! Thank you! Such a tasty combination of flavours Lou. Thanks for all the recipes!